Baker, G.R., A. MacIntosh-Murray, C. Porcellato, L. Dionne, K. Stelmacovich and K. Born. 2008. "Trillium Health Centre." High Performing Healthcare Systems: Delivering Quality by Design. 245-266. Toronto: Longwoods Publishing. The product of a merger between the Mississauga Hospital and Queensway General Hospital, Trillium Health Centre is a 751-bed community hospital serving over one million residents in Mississauga, west Toronto and the surrounding area. Its staff includes 4,400 employees, over 700 physicians and 1,100 volunteers (Leddy 2007). Trillium is guided by an ambitious mission called "Transforming the Health Care Experience" that aspires to "set the standard for outstanding health service delivery" and to be "courageous, innovative and evidence-based in efforts to improve the quality of services" (Trillium Health Centre 2007a). This bold aim, established by Ken White, the inaugural president and chief executive officer (CEO), has been matched by important achievements during the organization's 10-year history. Trillium has won local, national and international awards for excellent performance in clinical and administrative areas (see Table 1). This case study explores key factors contributing to Trillium's success, including leadership, strategic alignment of improvement activities, investments in staff capability and cultural development. A team from the University of Toronto Department of Health Policy, Management and Evaluation prepared this case study. One member of the team spent three months in a practicum at the health centre and collected information for the case between March and May 2007 (follow-up interviews were conducted in November 2007). She interviewed key corporate and physician leaders, as well as those in clinical and support services, and reviewed selected corporate documents. Two initiatives were researched in detail: The Safer Healthcare Now! (SHN!) initiatives in the Medical Surgical Intensive Care Unit (MSICU) and the Non-Nursing Task Force (NNTF) redesign of nursing and support service roles. Trillium leaders described their quality improvement journey as occurring in two phases. During phase one (1998-2005), board members committed to risk management and patient safety as strategic priorities. They adopted an innovative enterprise risk management approach to systematically prioritize investments within these areas of strategic focus (see Appendix A). Between four and five improvement initiatives focusing on high-risk, high-volume and high-cost patient groups were completed each year. Staff development was undertaken in several areas. CEO White promoted the concept of distributed leadership, suggesting that all staff members - with or without formal leadership titles - should develop and exercise their ability to lead. Resources were allocated to develop and implement the "Foundations of Leadership" course (see Appendix B). External experts were also used to mentor staff in improvement methods, and project management consultants introduced a systematic approach to planning, implementing and evaluating projects. These methods included identifying quantitative outcome measures for all proposed projects and identifying the staff resources required to lead and implement proposed projects. Front-line clinical staff were seconded to improvement projects across the health systems. These secondments were designed to build individuals' improvement capabilities and assist later in project implementation. However, there were no formal ways to ensure the spread of improvement knowledge and skills once the seconded individuals returned to their local health systems. While this strategy was successful in some cases, it failed to ensure organization-wide diffusion of improvement expertise. In 2000 the Performance Excellence (PE) portfolio (the term used at Trillium to refer to quality improvement) was created. Given equal status with the clinical health systems and strategic business units (SBUs), the creation of the PE portfolio signalled leadership commitment to quality improvement. PE supports health system and SBU improvement work, develops quality improvement expertise and enables the spread of best practices. 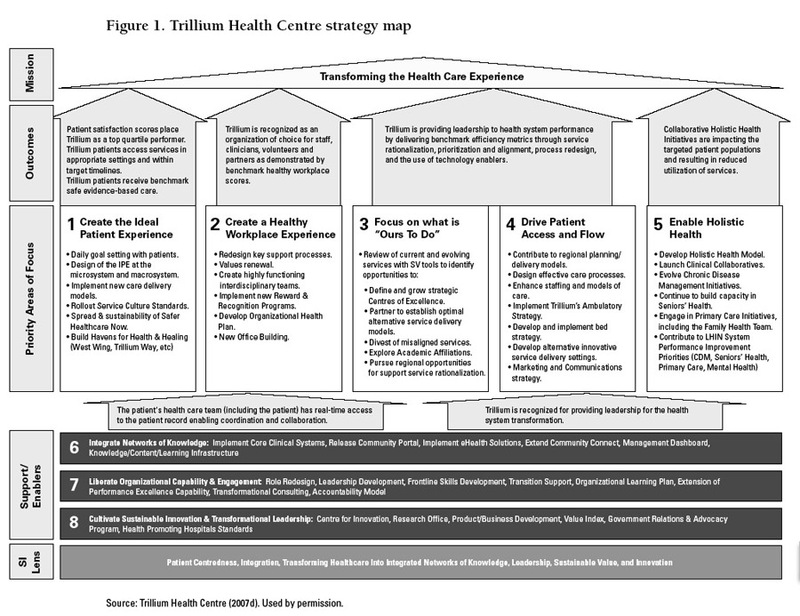 By 2005 Trillium's improvement strategy had broadened from building baseline capability to a focus on transforming the healthcare experience "beyond the walls of Trillium to the broader community at large" (White 2007). Use of external consultants was de-emphasized while internal resources were augmented. In 2007 White put forth a new management strategy aimed at "all aspects of service, and in partnerships with others, to lead the industry in recognition for quality, outcomes and leading edge health service innovation." Investments in staff education accelerated in phase two (2005-2007). Three new courses were developed to educate team members about quality improvement tools and to teach managers and staff members about project management tools and techniques. Internal project management services were also developed to sustain the systematic approach to project planning and implementation. Trillium also strengthened its commitment to pursue external awards to reward staff members, validate Trillium's achievements and provide an external forum for knowledge exchange. Investments in information technology (IT) were increased in phase two, commencing with the THINK (Transforming Healthcare into Integrated Networks of Knowledge) project. THINK was aimed at providing a standardized platform for clinical and administrative data collection and strengthening decision support capabilities based on electronic health records. 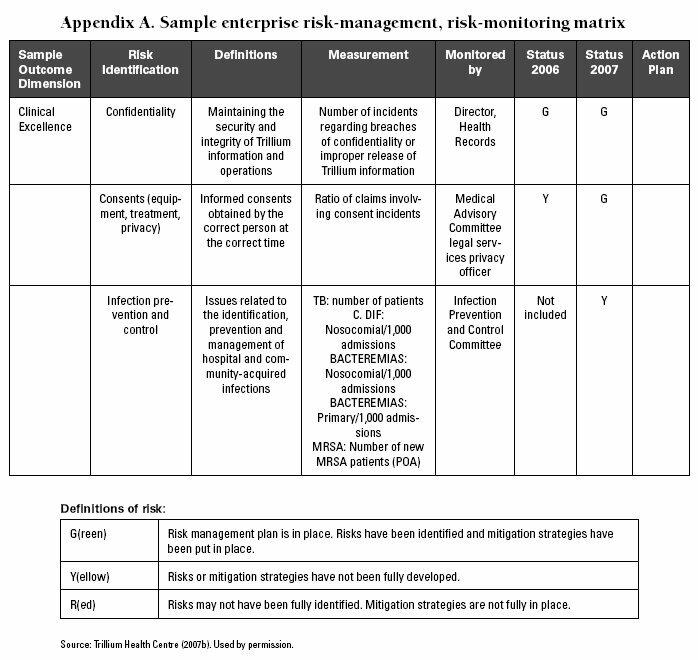 Trillium's board, guided by an innovative risk monitoring matrix (see Appendix A), increased its support of risk management and patient safety initiatives. Board members also established the Quality Monitoring Committee to oversee care quality. This committee identified and monitored indicators for clinical excellence, including hospital standardized mortality ratio (HSMR), the number of adverse events causing harm per 1,000 patient days and other targeted clinical benchmarks. Criteria for prioritizing quality improvement initiatives shifted in phase two from a focus on improvements for high-volume, high-cost and high-risk patients in targeted areas to improved care across multiple health systems involved in episodes of care. This change was also intended to create a system perspective, shifting staff views of patients from one that identified them as patients of a local unit (e.g., emergency department patients) to one that identified them as "Trillium" patients from admission through discharge. Focus on What Is "Ours to Do"
These priorities were selected in order to advance the delivery of safe, evidence-based care; to establish Trillium as an "organization of choice" (see Figure 1) for staff and volunteers; and to align strategic priorities with Ontario's health system transformation agenda. The development of structures and processes to support improvement work was accompanied by efforts to shape Trillium's organizational culture. Explicit messages from the CEO on topics such as innovation and leadership combined with capability-building opportunities aimed at creating "the Trillium way" and an optimistic "just do it" culture that embraced change. Staff members described this culture as an enabler of quality improvement and as a source of pride and identity. They expected to be innovators in Canada's healthcare system and to participate in transformative projects. Staff members viewed the distributed leadership philosophy as having created the perception of a flattened organization. They felt the new philosophy allowed clinical staff to engage in improvement work and to build on long-standing team relationships with considerable success. Staff were encouraged to participate in these activities and the detailing of care processes, and identification of improvement opportunities were provided by the most knowledgeable team members, rather than only the most senior team member. This approach enriches discussion and improves each team's ability to identify changes most likely to result in further improvements at the front lines. Leadership, strategy, staff capacity-building and organizational culture developed in phases one and two contributed to an environment that enabled Trillium to participate effectively in SHN! and to develop new improvement initiatives, such as the NNTF. In 2003 Director of Medicine Patti Cochrane was introduced to the medical emergency teams (METs) concept at an Institute for Healthcare Improvement (IHI) conference. Cochrane brought the concept back to Trillium. The Safer Healthcare Now! (SHN!) campaign and its partner campaign in Quebec, Together, Let's Improve Healthcare Safety, is a pan-Canadian patient safety campaign. Modelled after the 2004 Institute for Healthcare Improvement (IHI) 100k Lives campaign, SHN! introduced six evidence-based interventions to reduce avoidable deaths in hospital during phase one of the campaign. These were: AMI - Improved Care for Acute Myocardial Infarction, CLI - Prevention of Central Line-Associated Bloodstream Infection, Medication Reconciliation, RRT - Rapid Response Teams, SSI - Prevention of Surgical Site Infection, and VAP - Prevention of Ventilator-Associated Pneumonia. Six hundred teams from over 180 healthcare organizations are presently enrolled in SHN! Thirty teams from 15 healthcare organizations are presently enrolled in the Quebec campaign. Trillium Health Centre participated in all six bundles offered in phase one of the campaign. Early phase one campaign results, presented in Montreal in March 2007, demonstrate improved quality of care and patient outcomes. Phase two of the campaign was launched in Spring 2008. METs (also known as rapid response teams or critical care outreach teams) are interdisciplinary groups of intensive care staff that provide assistance to patients outside of intensive care units (ICUs). In early 2004 members of Trillium's medical surgical ICU (MSICU) attended an IHI Critical Care meeting, where they learned more about the role and organization of METs. Later that year Trillium joined the Canadian ICU Collaborative, which is an effort of ICU staff from across Canada focused on using quality improvement methods to implement evidence-based practices to improve care outcomes (Canadian ICU Collaborative 2007). Through participation in the ICU Collaborative, Trillium members learned the skills needed to implement an MET as well as the interventions required to reduce ventilator-associated pneumonia (VAP). Team leaders were named for both of these efforts and later for other initiatives launched as part of SHN! (see sidebar). METs require high levels of team communication and coordination. The organization of registered respiratory therapists (RTs)1 at Trillium enabled the development of an MET. RTs were already being used at Trillium as the first staff responding to calls when patients outside of MSICU showed symptoms of cardiovascular deterioration. The introduction of an MET team, comprised of nurses and RTs, built on established team relationships and patterns of communication. Trillium's experience with quality improvement and patient safety initiatives also helped the MSICU staff in their work on SHN! interventions. Membership in the ICU Collaborative, availability of order sets applicable to the VAP bundle, continuity of team leaders for METs and central line-associated primary bloodstream infection (CLI) teams as well as positive relationships between RTs and floor nurses formed a ready foundation when the SHN! campaign was introduced to the MSICU in May 2005. Unlike many other organizations that enrolled in SHN!, Trillium developed a project management structure and implementation plan for its SHN! efforts (Trillium Health Centre 2005a). Following project management principles, a project profile was completed that identified critical project elements (see Table 2), including project rationale and scope, objectives and outcome measures, critical success factors, cost/benefit analysis, staging and spread of bundles and communication plans. Trillium's project management structure requires significant resource allocation. Senior management approved the funds required for the campaign's process interventions (see Appendix C). This decision was shaped by the view that Trillium needed to provide the safest care possible if it were truly to transform patients' healthcare experience. The project support provided to Trillium teams involved in SHN! was an important contributor to their success. Chief Nurse Executive Pam Pogue remarked that, in her view, releasing staff to do improvement work, rather than expecting that it be added to regular responsibilities, has been the single most important success factor in Trillium's quality improvement efforts. The project management framework, which requires identifying the staff and time commitments needed to implement each initiative, provided this structure for the SHN! campaign. In August 2005 an SHN! project board was established to coordinate the campaign, guide team leads, provide decision support and support resourcing requirements. This board, along with physician champions and leadership support, provided stewardship throughout the campaign's first 18 months. As discussed earlier, MSICU staff members' participation in the ICU Collaborative provided them with eight months of experience prior to the implementation of an MET and the VAP bundle. The CLI team, led by Tina Leon-Garcia, was launched in February 2006. Its goal was to reduce CLI in MSICU by 50% by December 2006. A two-stage pilot was planned that involved implementing two groups of evidence-based practices recommended for reducing infections: The insertion bundle and the maintenance bundle (see Table 3). Source: Trillium Health Centre (2005a). Used by permission. The CLI team faced several challenges, including how to collect the measures requested by the SHN! campaign. Information required to calculate the rate of CLI per 1,000 catheter days was not readily available and involved manual chart audits of all MSICU patients with positive blood cultures. Moreover, the total number of catheter days was required to calculate the first measure, and these data were also not routinely collected at Trillium. Several trials were undertaken in order to establish an efficient collection process. These included paper-based manual counts completed each shift by the MSICU charge nurse and data capture by health records coders. In the end, partnership with THINK's IT consultants provided a better solution, and MSICU staff can now enter real-time CLI day counts into a database. Source: Safer Healthcare Now! (2007b). Used by permission. The development of standardized order sets by Intensivist Dr. Chris O'Connor facilitated implementation of the VAP bundle. By 2007 over 275 order sets had been developed to improve quality of care. Of those developed, the oral care routine and deep venous thrombosis prophylaxis order sets were implemented as part of the VAP bundle (see Table 4). Access to these order sets, and team familiarity with VAP through membership in the ICU Collaborative, created a ready environment for implementation of the bundle. At inception, the VAP team, led by Rosanne Leddy, sought a 50% reduction in the rate of MSICU-acquired VAP. Source: Safer Healthcare Now! (2007c). Used by permission. Multiple improvement cycles were required to implement several other aspects of the VAP bundle. Variation in the identification of patients with VAP led to greater standardization and use of RTs in identifying patients with VAP in MSICU. RTs also assumed accountability for monitoring head of bed (HOB) elevation, a procedure that previously had low compliance. Random HOB audits and electronic reminders were trialed in 2005, but proved ineffective. After conducting several small change tests, RTs identified two successful strategies: posting signage at the heads of beds and educating families at the bedside. These improvements led to HOB compliance of between 95% and 100% for 18 months. As a result of these and other changes, the VAP rate in MSICU fell 74%, from 20.71/1,000 ventilator days to 5.43/1,000 ventilator days between January and November 2006, thereby exceeding the project's initial goals. Because the team functioned outside of MSICU 24/7, the MET pilot differed from the CLI and VAP pilots in both scope and visibility. Staffed by critical care nurses and RTs, and supported by intensive care physicians, the MET brought critical care support to patient bedsides throughout the hospital. One challenge team members faced was the historically strained relations between floor and ICU nurses and the perception of some ICU nurses that floor nurses' critical care assessment skills were deficient. To overcome this barrier, a hospital-wide campaign, led by the MET leader Michael Cass, was carried out prior to launch to educate staff on the role of the MET and to foster collaboration. In addition, critical care staff members selected for the MET were chosen for their soft skills: communication, mentorship and team-building abilities. Team practices reinforced these skills and the MET provided prompt feedback on individual patient outcomes to staff members on the pilot unit. Within nine months of launch, the volume of medical health system patients diagnosed with cardiac/respiratory arrest decreased 55%, the ICU readmission rate for this patient group decreased 14% and MSICU mortality fell 28% (Cass 2003). Table 5 presents the results after 22 months of operation on medicine, surgery and neuromusculoskeletal (Neuro/MSK) services. The data presented in Table 5 were extracted from the discharge abstract database as a proxy outcome measure for the MET. Deceased patients may or may not have been seen by the MET prior to death, and cause of death may or may not have been cardiac/respiratory arrest. Early success, measured by a reduction in cardiac/respiratory arrests and downward trending in unit-level mortality data, facilitated the spread of the MET throughout the hospital. Subsequently, the MET began to receive requests to provide support for many aspects of nursing practice beyond its initial scope, including calls to assist with dispensing medication and dealing with challenging family situations. These issues led to new workshops developed by clinical nursing educators. Several other quality improvements emerged in the MET pilot. Among them, medical directives were developed to enable MET nurses to order lab work, chest X-rays and electrocardiograms. Other directives allowed nurses and RTs to order blood gases before contacting the most responsible physician (MRP). Together, these directives created significant team efficiencies. Weekly patient safety rounds were also established in MSICU to disseminate lessons learned from actual cases and to solicit ideas for improvement. Finally, monthly patient safety rounds were provided organization-wide to generate interest across multiple health systems. Source: Cass (2007). Used by permission. In addition to the SHN! initiatives at Trillium, there are a number of other projects that have generated important improvements. The NNTF is one such example. These tasks occurred on all shifts (although more frequently at night) and required each nurse to spend, on average, 24 minutes looking for linen and 44 minutes performing housekeeping duties on each shift. Completing these tasks reduced nurses' time available to complete bedside care, delayed the admission of new patients to the units and decreased nurses' job satisfaction. Moreover, these findings did not align with the vision of future nursing practice espoused by senior nursing leadership or with Trillium's strategic goal of providing an "ideal patient experience." Interruptions in nursing care were also thought to increase the likelihood of error (Chisholm et al. 2000), which introduced a patient safety component to the project. The NNTF was co-led by a front-line nurse, Karen Kallie, and a porter, Lakis Faragitakis. A steering committee guided the planning and delivery of NNTF work. The NNTF's aims were to improve patient care by designing a service model that would enable nurses to work within their optimal scope of practice and enlarge the support staffs' contributions to patient care. Internal and external environmental scans were completed to inform small- and large-scale tests of the changes required to redesign the service model. Performance metrics - including patient satisfaction, nursing satisfaction and unit cleanliness - were compared pre- and post-pilot to determine whether changes to the service model resulted in improvement. Once the pilot was operational, the NNTF worked diligently to develop baseline process maps to describe in-patient admissions, missing medications, dinner tray delivery, night cupboard stocking, portering/paging and portering for diagnostic imaging processes. A number of improvement ideas were developed based on this analysis. Those that were achievable within existing budgets were tested and, if proven successful, were implemented. For example, volunteer service teams assumed accountability for several non-nursing tasks, such as greeting and directing family members on units and distributing water to patients. These teams were assigned to dedicated units on an ongoing basis, rather than receiving daily assignments throughout the hospital. Pharmacy services installed a uniform bin system on all in-patient units to expedite medication drop-off and pick-up, thereby reducing the frequency of missed medications. Other changes included redistributing the work done by nursing, portering and environmental/hospitality associates. 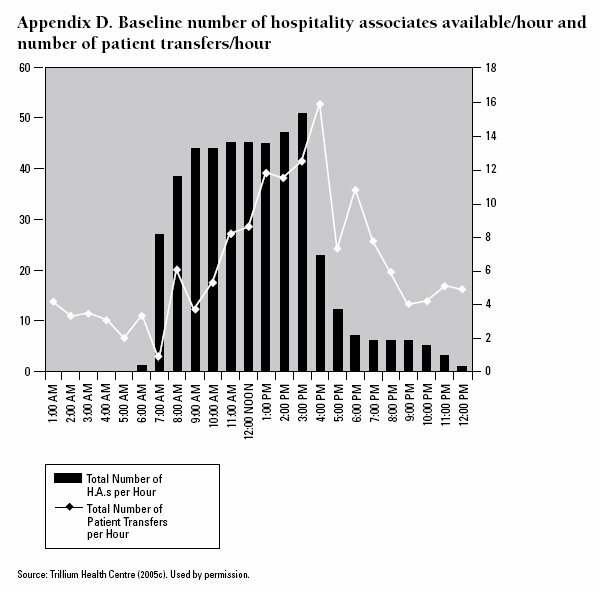 The availability of environmental/hospitality associates was matched to service demand at peak in-patient unit admission times (see Appendix D). The new service model that emerged required environmental associates to clean all non-patient areas. It also required hospitality associates to help nurses transfer patients to stretchers and to clean patients' rooms. Evaluation of the new model suggested it resulted in less time spent by nurses on non-nursing tasks (see Table 6) and cleaner patient units (see Table 7). Source: Trillium Health Centre (2007e) and NNTF co-team lead. Used by permission. Source: Trillium Health Centre (2007e). Used by permission. Benefits to patient safety were not directly measured during the pilot; however, nurses reported that they perceived the new service model resulted in enhanced point-of-care safety. Collectively, these process improvements decreased the mean number of missing medication from 1,231 per week (June 2005) to 370 per week (November 2007). This change represents a 70% decrease from the peak and a 32% reduction from the rate observed in November 2006. These improvements reduced the length of time nurses spend searching for missing medication by 50% per shift and, reportedly, improved team dynamics. In an effort to measure the outcome of this type of work at a system level, senior leadership developed a new indicator: "capacity liberated for staff and physicians." This indicator measures the percentage of full-time equivalent positions created annually through waste reduction and process improvements. Ken White stepped down as CEO of Trillium Health Centre in early 2007 and Janet M. Davidson began her tenure as president and CEO of Trillium in March 2007. Coupled with continued financial pressures on hospital budgets in Ontario, this leadership transition led to changes in Trillium's corporate strategy. One key change was the disbanding of the PE portfolio and the redistribution of its quality improvement functions to the patient services and quality portfolio, and to the chief financial officer's portfolio. A new portfolio, Strategic Planning and Business Transformation, was created and additional accountability mechanisms were introduced to promote effective resource management. Senior leadership also committed resources to project management consultation and the use of Lean improvement methodology. A new quarterly report was created for the Quality Monitoring Committee that draws in mandatory indicators from various sources (e.g., SHN!, Canadian Council on Health Services Accreditation). In addition, the vice-presidents of patient care and medicine have been nominated to support the committee by providing clear communication links between the committee and Trillium's senior team. The growing regional focus on service delivery in Ontario has increased the pressure on Trillium to collaborate with many agencies. As a regional cardiac care centre, for example, Trillium serves patients from across the region and the province, and depends on the smooth operation of the larger system to provide quality care to these patients. System issues, such as the availability of emergency transport and variations in standards of care from facility to facility, can affect patient outcomes. Trillium is participating on a regional cardiovascular steering committee with other hospital representatives, paramedics, primary care representatives, the Ontario Ministry of Health and Long-Term Care and community care access centres to address system-wide issues. Leadership has provided clear, consistent messaging in areas of strategic priority. Notably, this has included commitment to the provision of safe, evidence-based care and the creation of the ideal patient experience. This strategy has supported structures, such as the PE portfolio, and processes, such as the routine use of the project management model to guide cycles of improvement work. The timing of investments has also contributed to Trillium's success. In phase one, the CEO introduced an innovative system-wide framework of distributed leadership to engage staff at all levels of the organization. Staff development focused on leadership, quality improvement and project management skills capable of moving the Trillium strategy forward. The evolution of unit-level improvement work to system-level efforts such as the MET and NNTF has benefited from both the new support structures and staff members' skills. Collectively, these investments have shaped an organizational culture now known as "the Trillium way." With growing experience, the application of improvement methods has spread from the patient care portfolio to the business and financial portfolios. Leadership support for the Quality Monitoring Committee and a framework to monitor key quality indicators provides a strategic perspective on quality performance. The PE portfolio has been redistributed on the premise that this structural change will "embed" quality improvement expertise across the organization. Trillium's continuing success rests on its ability to address several challenges. These include the need to continue developing staff members' leadership and improvement skills in order to sustain investments in improving care, despite financial pressures; to fully realize IT efforts; and to ensure that emerging regional service delivery and governance arrangements support local initiatives as well as system improvements. Emerging shortages in nursing, medicine and other health human resources make secondment of front-line staff to improvement roles difficult. For nearly a decade, Trillium has selected and trained front-line clinical staff for improvement projects as a means of building skills and improving care. The NNTF, for example, was co-led by a front-line nurse and a porter. Health human resource shortages may limit Trillium's future ability to second staff members, to backfill resulting vacancies and to redesign clinical positions for staff returning from secondment terms to facilitate their ongoing participation in improvement work. The sustainability of improvement work presents a second challenge. While Trillium's "just do it" culture has stimulated much activity, it often results in staff participating in many concurrent improvement activities. The sheer volume of these competing priorities may limit the sustainability of individual projects. This challenge emphasizes the continuing need to prioritize project commitments systematically, to divest those projects that produce marginal outcomes and to complete priority projects before engaging in new ones. The IT infrastructure available to support Trillium's improvement work presents a third challenge. One objective of the THINK project is to create a standardized platform for clinical and administrative data collection; however, this goal has not yet been realized. In the interim, a gap exists between desired and actual IT functionality, requiring some manual data collection. The capability to produce the routinely collected data SHN! teams and other projects require is still not available, a lack that further adds to the burden of data collection and analysis. A fourth challenge arises from the immediate fiscal pressures experienced by all Ontario hospitals and reliance on a funding model for long-term, large-scale improvement projects. Buoyed by an emerging improvement culture, the immediate challenge for Trillium leadership is to support continued investments in improvement capability while responding to fiscal pressures. Members of the Strategic Planning and Business Transformation portfolio will face tough decisions on these issues. SHN! was funded from fiscal year 2005-2006 to fiscal year 2006-2007 by using "project dollars" from outside of health system budgets. Project dollars are available on a time-limited basis; ultimately, improvement projects' operating costs become the responsibility of their respective health system(s). The impact of this funding model on the sustainability of initiatives such as SHN! is unknown. Finally, Trillium's position as a high-performing organization within an evolving regional care delivery system has created challenges. Discrepancies between organization-level and regional capabilities have constrained the organization's ability to deliver consistent high-quality patient care in the past. New structures such as Local Health Integration Networks amplify Trillium's need to provide regional leadership for health service transformation. To be effective, leaders must understand the "DNA" of Trillium and our future plans, and see them in the context of a changing world. Develop an understanding of the true nature of who you are and what you bring to the role of leadership. Learn to use transformational change as a catalyst for enhanced performance and how to work with change resisters and those who feel like the victims of change. Learn to engage others and to create support for strategies and solutions with such skills as other-centred communication and listening. Learn to guide problem-solving when working with individuals or teams by clearly identifying root causes, finding creative solutions and developing a commitment to move forward. Participants will begin to make sense of the constant ebb and flow of change and explore how they can apply new learning about complex, adaptive systems to their work. Each participant is expected to identify a learning partner who will meet with his/her each week to help them understand and apply their learning. Source: Trillium Health Centre (2005b). Used by permission. Cass, M. 2003. Trillium Medical Emergency Team. PowerPoint presentation. Unpublished. Cass, M. 2007. Trillium's Medical Emergency Team. PowerPoint presentation. Unpublished. Chisholm, C., E. Collison, D. Nelson and W. Cordell. 2000. "Emergency Department Workplace Interruptions: Are Emergency Physicians Interrupt-Driven and Multitasking?" Academic Emergency Medicine 7(11): 1239-1243. Leddy, R. 2007. Ventilator Associated Pneumonia: Our Journey and Preliminary Results. PowerPoint presentation. Unpublished. Mills, A. 2007. "It Just Isn't Here! ": Using a Six Sigma Approach to Reduce Missing Medications. PowerPoint presentation. Unpublished. Trillium Health Centre. 2005a. Safer Healthcare Now! Project Profile. Mississauga, ON: Author. Unpublished internal document. Trillium Health Centre. 2005b. Safer Healthcare Now! Project Budget Final. Mississauga, ON: Author. Unpublished internal document. Trillium Health Centre 2005c. Baseline Number of Hospitality Associates Available/Hour and Number of Patient Transfers/Hour. Mississauga, ON: Author. Unpublished internal document. Trillium Health Centre. 2007b. Enterprise Risk Management Risk Monitoring Report. Mississauga, ON: Author. Unpublished internal document. Trillium Health Centre. 2007d. 2007-2009 Strategy Map. Mississauga, ON: Author. Unpublished internal document. Trillium Health Centre. 2007e. Trillium Health Centre 3M Health Care/Canadian College of Health Service Executives Health Care Quality Team Award Submission. Mississauga, ON: Author. Unpublished internal document. Trillium Health Centre. 2007f. Trillium Corporate Key Quality Indicator Report. Mississauga, ON: Author. Unpublished internal document. White, K. 2007. Turning Trillium Inside Out: A Leaders Perspective. PowerPoint presentation. Unpublished. Yerema, R. 2004. Canada's Top 100 Employers. Toronto: Mediacorp Canada Inc.
1 RT will be used when referring to a registered respiratory therapist to avoid confusion with rapid response team.